Ask fellow campers about "Paradise Valley Campground" and nearby attractions. This is an all privately owned deeded lot RV Campground with gated entry. Describing the sites is not possible as they are all privately owned and vary from a simple gravel pad to fully paved & landscaped with wooden decks and small cabins. The arrangements to rent are made by contacting each owner individually to agree to terms. Park closes for the year to visitors on October 31. The park is very nice, and most if not all sites are well manicured and the place has a neighborhood feel to it. Sites are laid out on curvy roads and are all different, but larger than commercial RV parks. The people were all very nice on our visit, inviting us to join them for ice cream every other week at the community pavilion. This place is best for someone wishing to stay for a couple weeks up to a season, it is probably not worth the trouble if only for a couple of nights. Very wooded, and has a small stream running through the property that is rumored to have trout in it. This is a good bet if looking for a good deal in a safe non-transient environment. Some sites have amenities well beyond what one would find at a typical RV park. I don't believe there are public bath or shower rooms at this park, so keep that in mind. We camped at Paradise Valley Campground in a Fifth Wheel. The Alpine Village of Helen nearby has authentic Oktoberfest, and traditional German architecture and food. There are quite a few hiking trails nearby, and the Appalachain trail is about 5 miles away. Mt. Yonah is a nice hike just East of Cleveland. North Carolina is about a half hour away. Lots of local produce stands, flea markets, and big lots type trading companies with good deals on a variety of products. Best campground in Georgia. Friendliest people in the country. We camped at Paradise Valley Campground in a Motorhome. This is a gated community, privately owned campground with deeded lots. Some lots have just RV's on them and others have cabins and a RV. Some lots are available for rent during the season from private owners. We camped at Paradise Valley Campground in a Cabin. This is a beautiful private ownership campground in the heart of North Georgia Recreation Area. All paved roads. Community water and sewer. Many owners rent sites. Some sites have Park Models or 5th wheels available. Some sites have Cabins and large decks over looking the Stocked Trout Stream. 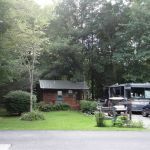 We stayed on lot 133 which is back in, big rig friendly with full hook ups a large deck and guest cabin with full bath. We camped at Paradise Valley Campground in a Motorhome. Are you affiliated with Paradise Valley Campground ?